Six Flags® Great Adventure & Safari combines the thrills of an amusement and water park with the sights of an African Safari. Located in Jackson, New Jersey, this theme park is an ideal getaway for residents and visitors in New York, Pennsylvania and other neighboring areas. 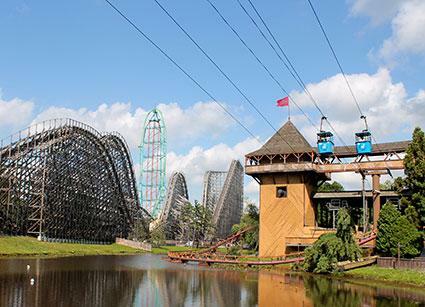 According to the park's website, Six Flags Great Adventure & Safari is the largest amusement park in the world. With thrill rides, family rides, an African safari and loads of entertainment, this theme park provides plenty of fun and excitement across its 510-acre expanse. Kingda Ka: With a top speed of 128 miles per hour and 45-story elevation, this roller coaster is a true thrill-seekers' paradise. As of 2016, it holds the record for fastest coaster speed in North America and is the highest in the world. Superman: Ultimate Flight: A unique roller coaster experience, this thrill-ride has riders lying face down in their seats for the full flying experience. It features loops, spirals and speeds reaching 60 miles per hour. Batman: The Ride: A thrilling ride awaits guests on this suspended roller coaster, with plenty of twists and turns that reach speeds of 50 miles per hour. Due to popular demand from Fright Fest, the ride is temporarily running backwards for even more thrills. Zumanjaro: Drop of Doom: This thrilling ride is the tallest drop tower ride in the world. Ride up over 400 feet in the air, then rocket down at speeds reaching 90 miles per hour! Note: These thrilling rides are limited to visitors 54" or taller. Sawmill Log Flume: This ride is a classic water log ride. You go through a windy river and take a 4-story plunge along this fun-filled ride. Expect to get wet! Minimum height requirement: 42". Bugs Bunny Barnstormer: This fun ride is made up of 20 small biplanes in a carousel that elevates and drops as it circles around the Looney Toons Seaport. Minimum height requirement: 42". Dare Devil Dive: This ride offers a combination of bungee jumping, skydiving and hang gliding rolled into one experience. Climb up to the 155 foot tall structure to initiate this experience, which will have you free-falling up to 60 mph. Minimum height requirement: 42". Adventure Seaport: Geared toward children, Adventure Seaport has plenty of pint-sized rides and, of course, the Looney Tunes characters. The Wild Safari is a 350-acre safari that takes guests through an African setting where more than 1,200 animals roam. Animals include elephants, giraffes, lions, zebras, bears, tigers, kangaroos, and more. The Camp Aventura Station provides education about the animals, as well as exhibits and plenty of opportunities get up close and touch the animals. A ziplining adventure is also available here. On TripAdvisor, visitors recommend seeing Wild Safari in the morning, because the animals are generally more active and visible, not to mention the lines can be much shorter. Those visiting later in the day may find it hard to locate animals who are seeking shade from the afternoon heat, and some guests have waits of up to three hours during busy times. A number of fun performances await guests throughout the park, including shows and street performers. The Northern Star Arena offers musical performances at various times throughout the season. Check the daily show schedule when you arrive at the park to plan your day. The park has an arcade on-site, where family and friends can play games and trade-in tickets for prizes. What would a top-notch theme park be without a variety of food and snacks? 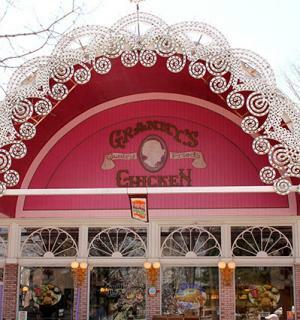 Six Flags Great Adventure & Safari has a number of snack kiosks and sit-down restaurants, including Granny's Kitchen, Best of the West and Mama Flora's Cucina. There are dining options in every section in the park, with choices to suit every taste. Italian food, pretzels, turkey legs, and other favorites such as hamburgers, hot dogs and ice cream are just some of the offerings. Season pass holders can purchase three levels of dining passes. The Basic pass allows you one lunch and snack at your home park. The Deluxe pass provides the same features as the basic, but with dinner included. The Gold package allows for the same benefits as Deluxe, but is valid at every Six Flags® theme park. Gold members also receive a sports bottle that allows you to enjoy unlimited soft drinks. Six Flags Great Adventure & Safari held its first-ever Holiday in the Park experience from November 21, 2015 through January 3, 2016. Christmas lights and decorations filled the park to give guests a truly festive holiday experience. While not all rides were open during Holiday in the Park, many special seasonal activities were added. Before Christmas, you could see Santa in his workshop preparing for his big day. After Christmas, he was still there - but resting. At the North Pole Village, children could go meet reindeers, send thank you letters to Santa, and even create a cozy companion at Bears 2 Go. Special holiday entertainment was available, like Storytime with Mrs. Claus and Jingle Jammers street-side carolers who sang Christmas tunes as guests warmed themselves by the fire. The park also added holiday treats into its menus. Across different sections of the park, you could find egg nog, hot chocolate and peppermint treats. The park is generally open from 10:30 a.m. to 10 p.m. in the summer months, with shorter hours other times of the year. As of January 2016, general admission to Six Flags Great Adventure & Safari is $69.99, while junior admission (under 54 inches) is $44.99 and children under the age of three are free. Significant savings are available if you purchase your general admission tickets online, in advance of your visit. Discount tickets may be available through various channels. Check with your AAA membership office, watch for Groupon coupons, or see what military discounts might be available. New Jersey residents may find in-state discounts from sources like New Jersey Law and Public Safety Credit Union and New Jersey Transit. You can purchase a Flash Pass for an additional charge, which will allow you to speed up your wait time by electronically holding your place in line for select rides. Pricing varies based on the level of pass you select and the type of admission ticket you have. A TripAdvisor reviewer raves about her experience with a Flash Pass. She states, "That thing made the entire day so much more enjoyable than standing in 2 hour lines for coasters that we rode in 5-10 minutes." Starting at $139.99, a season pass is an affordable option if you plan to visit multiple times. This pass allows unlimited access to all Six Flags® theme parks, and includes access to the park during Fright Fest and Holiday in the Park. Gold Passes that offer special parking privileges are available for $169.99. You can add an annual Shopping Pass that gives you a 20% discount on retail purchases at any Six Flags park in the U.S. In addition to the discount, pass holders will get a limited edition t-shirt. Six Flags Great Adventure & Safari officially works with Hotels Unlimited to offer vacation packages that include hotel rooms and park tickets. Hotels Unlimited represents Radisson, Days Inn, and Holiday Inn, all of which are within 20 minutes of the theme park. The average savings for Stay & Play packages are $145 as compared to hotel rack rates and separate ticket purchases. Get to the park about 30 minutes before opening to get a good parking spot and avoid lines getting into the park. If possible, avoid visiting the park on the weekends. The weekends tend to get very full, especially during the summer months. The Gold Flash Pass is worth the investment to avoid the long cues to get on rides. Try having meals at non-traditional hours, such as lunch at 2 p.m. and dinner at 7:30 p.m. to avoid the heavy rush. Ride the more popular rides (Kingda Ka, Superman: Ultimate Flight, etc.) early in the day or after 6 p.m.
Review the park map to familiarize yourself with the layout and identify places you want to visit. Set a location to meet friends and family in the event someone gets separated from the group. The park features over 50 attractions. While you can visit for one day to do specific rides, plan to stay two or three days to partake in all the activities and shows. If you're looking for a great place to enjoy a theme park adventure in New Jersey, Six Flags Great Adventure & Safari is an ideal choice. Have a great time when you visit the park!